Everyone WILL BE Saved or Everyone IS Saved? Welcome everyone to 2019! I pray in this New Year you experience more of Christ’s Life. I pray that the eyes of your heart will be opened to see the grandeur and magnificence of our Father’s Kingdom He has deposited within you. I also pray that you discern closely the voices speaking to your heart to deter you from the Truth, which is in Christ alone. For this reason, I will change the focus from our Grace Whispers to focus on issues which may deter you from your path In Christ. Please feel free to send me topics causing doubts, fear, or you are just wanting clarity on. Even though I am not a theologian, however, my seminary training, studying, and 40 years of walking with the Lord can shed a little light on various subjects. Over the centuries, the Body of the Lord Jesus Christ has always fought against false doctrines, false teachings, and false prophets. It is no different today. Today, the enemy deceives many by appearing as an angel of light, loving and caring to spread his gospel, which isn’t a gospel at all. Deception is always sprinkled with a little Truth; that’s why it is so acceptable and many will follow it. Any truth taken to an extreme result in error and all error contain a morsel of truth. But our Lord Jesus warned us in I Timothy; in the last days, there will be many falling away (apostasia, defection, forsaking) from The Faith to follow a lie. So in my next few blogs, I want to pose the question, “Is This True?” This will not be a long theological exposition but to shed light on the subjects based on Jesus’s teachings… The Truth, and what was written and believed by the early church believers throughout the centuries. Because if we don’t stand for something, we will fall for anything… especially sincere lies and deceptions. There are several doctrines deceiving believers of Jesus Christ from The Faith handed down to them by the Apostles; in this blog, I want to examine two. The first is Universalism. The premise of their belief is, “In the End, Everyone Will Be Saved.” The premise of their belief is founded on because of the Love our Heavenly Father has for us; He wishes that none perish, therefore, everyone will experience eternal life. Hell is only a myth, or a belief made up by religious people to get people to follow the Lord Jesus Christ out of fear of punishment. Universalism is a doctrine for all to enjoy God and celebrate God together; this includes every religion, including Christians, are welcome. It is a feel good Gospel not based on the scriptures at all. They welcome the Bible and any other belief system one may believe in. The second doctrine is more dangerous than the first one because it appears to focus on the Love and Grace of God and the saving work of Jesus Christ; it is called Inclusionism. The premise of this doctrine is, “We Are All Saved.” Inclusionism believes when Jesus died for the entire world, He died for everyone’s sin so there is no need to do anything else… all are now saved. Faith is a gift and we all have received this gift. We are all going to heaven whether we want to or not. God will not punish the children He loves. The WILL of man to make the choice for Christ is no longer necessary; God has decided for him. Man is just a puppet living as he pleases and when he dies, he may go to heaven or he may not. Jesus’s commission to the church to go make disciples of Him teaching them everything He taught them, has no merit and no purpose in this doctrinal belief system. Are these two doctrines true? What do you Believe? When looking at the word believe in the original Greek, it is an action verb which requires we do something? Believe (pisteuo) to be persuaded of, to place confidence in, to trust in, to rely upon, to commit to, to intrust. The Strong’s Concordance says – to have faith upon or in, to entrust one’s spiritual well-being to. With this understanding of the word believe, it requires every human being do something, to make a decision, to choose or not choose. The word believe was used 99 times in the book of John alone. It was used 248 times in the Bible. One of Jesus’s goals during His short life was trying to convince the Jews of who He was. With signs and wonders, He gave them proof of who He was so they would believe in Him. Many of the Jews rejected Him. Even though there are over 100 scriptures in the gospel alone to convince us to Believe and Receive the God-Man, Jesus Christ, let’s look at a few scriptures from the book of John and John’s final writings in Revelation from the Amplified Bible. Hear the heart of our Lord. John 1:7 (Speaking of John the Baptist) this man came as a witness, to testify about the Light so that all might believe [in Christ, the Light] through him. John 1:12 But to as many as did receive and welcome Him, He gave the right [the authority, the privilege] to become children of God, that is, to those who believe in (adhere to, trust in, and rely on) His name. John 3:15 So that whoever believes in Him will have eternal life [after physical death, and will actually live forever]. John 3:16 For God so [greatly] loved and dearly prized the world, that He [even] gave His [One and] only begotten Son so that whoever believes and trusts in Him [as Savior] shall not perish, but have eternal life. John 3:18 (Because of man being born in sin) Whoever believes and has decided to trust in Him [as personal Savior and Lord] is not judged [for this one, there is no judgment, no rejection, no condemnation]; but the one who does not believe [and has decided to reject Him as personal Savior and Lord] is judged already [that one has been convicted and sentenced], because he has not believed and trusted in the name of the [One and] only begotten Son of God [the One who is truly unique, the only One of His kind, the One who alone can save him]. John 12:46 I have come as Light into the world so that everyone who believes and trusts in Me [as Savior—all those who anchor their hope in Me and rely on the truth of My message] will not continue to live in darkness. Revelations 22: 14–15 Blessed (happy, prosperous, to be admired) are those who wash their robes [in the blood of Christ by believing and trusting in Him—the righteous who do His commandments], so that they may have the right to the tree of life, and may enter by the gates into the city. 15 Outside are the dogs [the godless, the impure, those of low moral character] and the sorcerers [with their intoxicating drugs, and magic arts], and the immoral persons [the perverted, the molesters, and the adulterers], and the murderers, and the idolaters, and everyone who loves and practices lying (deception, cheating). Is this true that ALL Will Be Saved or ALL Are Already Saved? The Truth is, Jesus did die for the sins of the whole world. He completed the work of restoring us back into a perfect relationship with our Father. Salvation is a FREE gift to every human being. But, His question to us is, will we Believe and Receive Him, THE GIFT OF ETERNAL LIFE? The message of the Gospel handed down to us by the Apostles is, to Believe and Receive the one the Father has sent to us and to Obey Him. Jesus prayed for us in John that we would Believe in Him, trust, and rely upon Him. We are chosen to share His Life and message with others so they would Believe He is the Savior of the world. 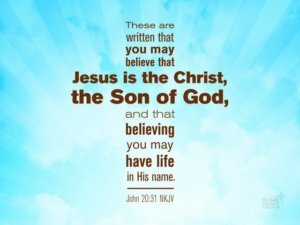 The Eternal Life given is Jesus Christ and as we Believe in Him and Receive Him… we have Eternal Life! We will look more at Eternal Life in our next blog?